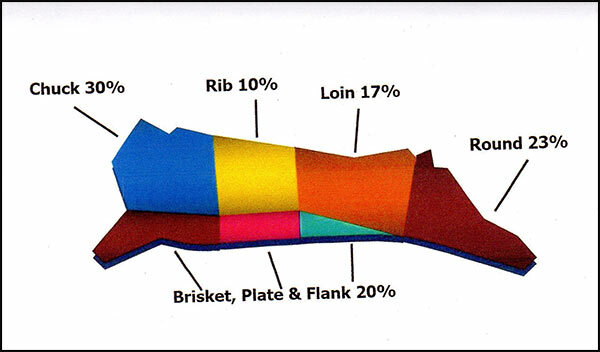 As the first step in our custom beef processing, we age the beef for 14 days. If you would like to have it aged longer, please call us for pricing: we offer a 21-day option. Our typical days for beef harvest are Tuesday, Wednesday and Friday. We will need cutting instructions (how you want it prepared) within 7 days of harvest. Need more information before you start? Please see our FAQ page. Please be sure we have your cutting instructions within seven days of drop off for beef. If we do not receive your cutting instructions by this time, a standard cut will apply. Click here to fill out a cutting instruction form. We will gladly hold your order for one week after notification. After that time, you will begin accruing weekly storage fees. Orders not picked up within the first 7 days will be charged the following: 1/4 Beef =$25.00, 1/2 Beef =$35.00, Whole Beef = $50.00. The storage fee will be charged each week after the first initial week. If you are unable to pick up within the first 7 days, please contact us so we can work with you. We accept the following forms of payment, due at pickup: debit cards, checks or cash. 1. Fill out our online form here. We are proud to have Northern Colorado's most experienced processing crew, using the latest technology to offer our customers the best cutting and packaging around. In addition to daily USDA inspections, our years of experience cutting and packaging ensures you get your meat processed your way.